Primera Technology Inc. hopes its new CD / DVD duplicator and printer, the Bravo II and Pro Disc Publishers, will become a "must have" for businesses in the document distribution industry. With the rising demand for materials produced on CDs and DVDs, Primera company might get its wish. "Most people have a little laser printer at their desks, and that's what we're trying to encourage with Bravo line of duplicators and printers," says Mark Strobel, Primera's vice president of sales and marketing. "It's not exactly the same comparison in price yet. But the point is, you don't need to network with a big, expensive piece of equipment anymore to get a quality CD or DVD copy." Primera, known for its Composer line of DVD / CD duplicators and Signature line of ink jet CD printers, recently expanded its offerings by developing the Bravo II. The machine, which has a built-in ink jet printer, produces 25 to 50 CDs or DVDs per job with resolutions of up to 4800 dpi. in full color. It's available in two models: Bravo II, which has (1) CD / DVD burner, and Bravo Pro with (2) burners and double the bin disc bun capacity (100 discs). Bravo's duplicator is compatible with computers that have Intel® Pentium IV or equivalent processors, 1 gigabyte of RAM, and Microsoft® Windows 2000 or XP professional operating systems. SureThing CD Labeler software is included. The duplicator also requires a USB 2.0 port, which is not included. Bravo II and Pro are both fully automated. A mechanical arm transports discs to the printer, allowing them to burn and print without assistance. A wide variety of firms use CD / DVD duplicators for multiple applications. "Systems with a fully automated process are what people want, and they are getting better and cheaper all the time," says Kevin Gabrik, vice president of Techware Distribution Inc., Minneapolis, MN. "It seems like every few months, the burners on these systems get faster and the printers improve." Techware began as a data storage distributor to graphic and pre-press companies, and started selling duplicators made by the three largest manufacturers: Microboards, Primera and Rimage Corp in 1996. Gabrik says many of his customers use duplicators to copy company catalogs and product manuals for distribution. "Instead of printing 1,000 or more 300-page product manuals, it's cheaper and takes up less space if you burn it on CD in a PDF file," he says. Techware also is accepting more requests for corporate recruitment videos and briefs on DVDs. Gabrik says his clients sometimes want Microsoft PowerPoint™ slides incorporated into DVD videos. He adds that firms should buy duplicators from established companies with dependable technical support services. 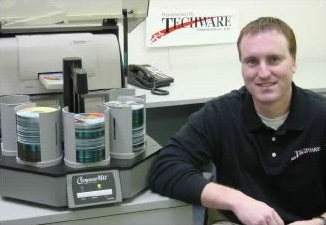 Kevin Gabrik, vice president of Minneapolis-based Techware Distribution Inc., says many of his company's customers use CD / DVD duplicators such as this ComposerMAX from Primera Technology Inc. Duplicators allow Techware's customers to copy corporate catalogs and product manuals for distribution. Gabrik's clients also copy corporate recruitment videos and briefs on DVDs. "It seems like every few months, the burners on these systems get faster and the printers improve" - Kevin Gabrik, V.P. of Techware Distribution Inc.